Well, it almost NOT Wednesday at all, but there's still JOY! This week has been a huge answer to prayer for me. For week I have seen my classroom fluctuate and seen my students and us as a staff struggle. I felt like at every turn we were just barely getting by, if that. I prayed for relief from the paperwork, for my students to make better choices, for peace, and even just for guidance! Well, the last couple days have been quite the answer to prayer. While my student's behaviors are far from over, I see where myself, the therapist working with my kiddos and most definitely my aides have all played a huge role in changing these kids! At every turn we are attempting to educate them, but they are right there responding with behaviors of their own. Some are violent rages while others are quiet and tearful sorrows. Either way, they are learning. I am blessed with a classroom of 12 tough and challenging young lives. They are often my toughest challenge and an awesome source of hope. I love my students. - One of my students this week was learning the word "have" and for months and months we have been working on penmanship. This young guy has been in my room for more than a year and we have seen a huge spike in behaviors.... but there are often glimmers of what his knowledge is. Well this week, this little guy wrote a lower case "e" with phenomenal accuracy. I shouted for joy when i saw it. Tears actually welled up in my eyes and I could not have been more proud! I know it does not sound like a huge success, but let me tell you, this was like a hurdle had been crossed. Thank you Lord! - Another factor is the staffing in my classroom. I feel at ease with the help that i have in the classroom. I continue to be astounded by the support that is given to the students in my room on a daily basis. (If you are reading this - from the bottom of my heart THANK YOU!) I see how the interactions of the staff in my classroom have helped my students. I am blessed to work with a team that cares so much for the little kiddos in our room. The best part is there is so much more to come. I look forward to continuing to work on this team. One of my team members is being reassigned next week and truly this person will be missed! It brings me joy to have had such a kindhearted person to work with. -I taught the students the water cycle this week. It was a really fun and enjoyable set of lessons and I really had a great time seeing the kids learn. I know i had something different written down in my lesson plan book, but sometimes the ability to roll with the punches and just go with your gut can be down right beneficial. The information I presented really worked for my group of students. Really glad to have taught them something! So that is what brought me joy this week. I hope that you found joy in something you did, saw, experienced, or heard. Please feel free to comment below and let me know what brought you joy this week! This weekend my husband and I made our first big purchase together! We got a brand new Chevy Traverse and completely LOVE it! It is totally one of those things where we both cannot wait to drive it, though it is different now because we do have to share the car! I will be the primary driver because it will be my mode of transportation to and from work, but it is our not-too- soon-but-soon-to-be family car! Here are a few shots of the new ride! This car will require a little getting used to because I have been driving a small little sedan for the entire time i have had my license. It is longer and harder to park, but truly I love this car! I have never had a car with all the little bells and whistles and this thing does! My favorites thus far? Oh boy... I love so much, but one favorite for sure is the heated and cooled seats! I have never had this and it truly is something i am going to be spoiled with! The other feature I LOVE and would not leave without is the dual sun roofs! Love that our passengers can see the sky in the back and feel the breeze! So this is why I have been exhausted! Getting a new car can be tiring! We spent our Friday night car shopping after a long week and have since returned tothe dealership twice! I also have been battling my allergies. I hate allergies but truly love my new car! I haven't shared much teacher stuff lately... so here's something my aides and i use on a minute to minute basis! So basically there are 2 hanging files (at least) per subject and the subjects go in the order of our daily schedule from front to back. So what you are looking at in the picture is Warm Up packets (you can see the tab hiding in the bottom right corner of the photo) and then Math with all their math work photocopied and ready to pull out the next unit, then test, and so on. After that there is handwriting which is in my spelling folder because we do handwriting while spelling tests are given. Then on to reading where you can see some manila folders (one saying "The Trains" and one for "The Ships" for some of the groups I have themed this year - I will post about this another time!) Anyway, you get the idea. 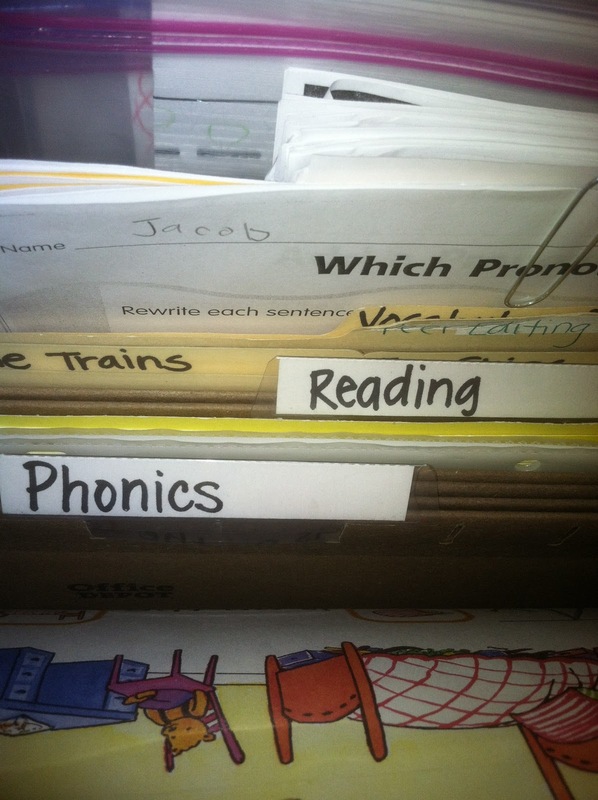 This way of organization may seem a bit hard to understand but once you get the hang of it, it can truly become a teacher and a teacher aide's helper. 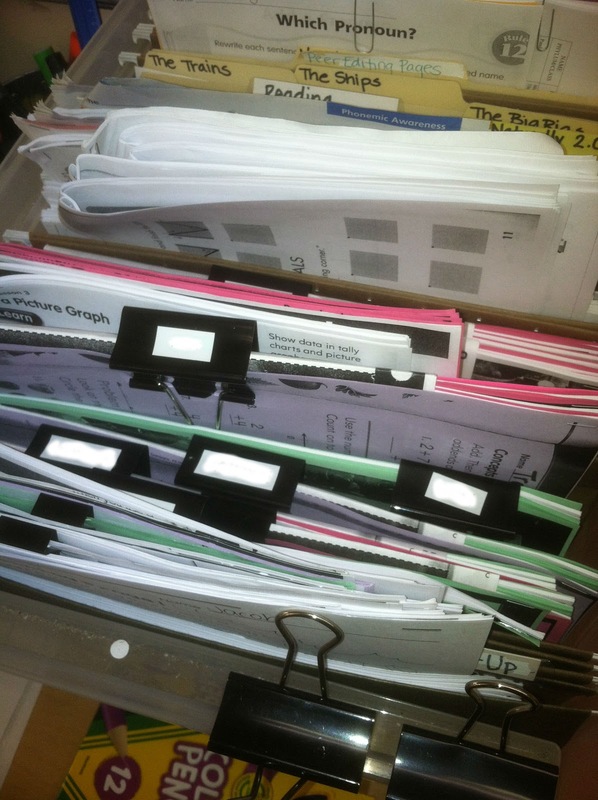 It makes it easy to just pull work out of the file box and it really makes it easy to plan and store work ahead of time. The trick is to always make sure work gets put back into the box when done working on that subject for the day. I am not a fan of one page worksheets and then having to make new work for each student each day. As a special educator that would mean i would never know where my students are at in the curriculum and i would be a basket case trying to figure out a classroom of 12 kiddos. 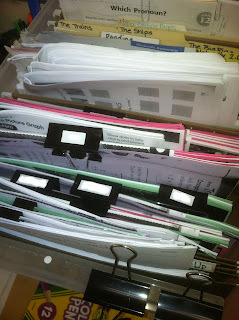 This is how i organize all my student's work and store up coming lessons! How do you do it in your classroom? So after fiddling around on this little blog last night ... APPARENTLY I deleted my post from yesterday on delicious breakfast. So i am breaking a rule and posting twice today! I was so mad at myself for not being more careful, but alas I know the recipe for breakfast sandwiches like the back of my hand! Besides it gives me a chance to show off the new signature one day early! This was also my link up post... so i am fixing my link as well! Head over to Six Sisters Stuff to see all the lovely links! My husband and I really love these little handfuls of warm and tasty goodness every morning! This recipe makes a bunch, so make sure you have enough room in your freezer if you would like to try these out. Also, a toaster oven is probably the best and quickest way to reheat/toast these little yummy handfuls! Begin by scrambling the eggs. All of them! You will feel like you are feeding an army, but this makes quite a few sandwiches! Here is also where you can add the shredded Monterey jack cheese. I add this because it helps the egg to stick together and who doesn't like cheese?!? You found me out - this time i used more than a dozen eggs. When i have a few extra eggs i throw them in the mix too! At this point I usually will set the scrambled eggs in the fridge to cool them a bit. Sometimes i even scramble the eggs the day before. This cuts down on the prep time a little when you go to put together the sandwiches. But cooling the eggs helps to make the eggs stick together a little bit better. I do this for the mess factor and also so i dont burn my fingers as I spoon the eggs onto the sandwiches! The next step is to put out the parchment paper and to cut the bread slices in half. Lay the slices of bread out on the counter. Then you can begin adding the cheese slices and then the lunch meat. For the sliced cheese I use a tray that is meant for party trays, but it helps to add variety in the cheese. You could find your own type of cheese and slice it yourself to save on cost. Its up to you! After all the cheese and meat are added, you are ready for the eggs! I use a tablespoon to scoop the eggs on top of the meat and then add salt and pepper to taste right on top! Next, stack up the sandwiches and you are ready to wrap! Once they are all stacked up, you can wrap them individually with saran wrap! I like to use the Costco brand saran wrap. It sticks the best, in my opinion. The next part is to stack them all up and head to the freezer! This recipe makes about 35-40 sandwiches and should last 2-3 weeks for 2 people, depending on how many times a week you eat these little warm yummies! Reheating directions: Defrost these by sticking them in the microwave with the saran wrap opened for 1 minute (for one sandwich) or 1 1/2 minutes (for 2 sandwiches). Then I flip them over and stick them in the toaster oven until evenly toasted on each side. Make sure to watch them the first few times you make these as they will burn and they will not be so yummy! So after all that... here's my new signature! Have a great Sunday! I'm hmm-ing and haw-ing about what to post today... but here goes nothin'! So, after this busy week, i realize how nice it was to have meals already prepared! This week for dinner I made Pasta Fagoli in the crock pot as well! I made a couple of changes and this recipe turned out wonderful. My only real change was on the pasta. I shop at Trader Joe's (love them!) and they have a really yummy selection of dried pasta. I especially like the pesto filled tortellini, but this week i went with the cheese filled tortellini! They were delicious in this recipe. 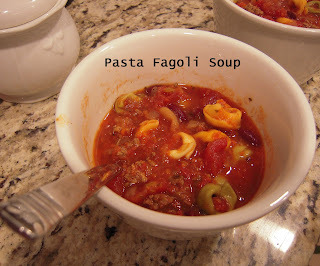 The other thing i did to make this great for dinner every night was to keep the pasta separate from the soup. So all my left overs are now going into the freezer into individual servings! They will be great in a couple weeks and I won't have to make several recipes at once! I have quite a bit left over too because we took my mom out for Valentines day! We also had salads for lunches this week and I made a yummy rice salad that we put on top of our salad greens and then added crock pot BBQ chick for a little bit of protein! I found the recipe for Crock pot BBQ Chicken here. The chicken recipe was delicious, but if you don't like too much spice, go easy on the pepper flakes! For my hubs and i the chicken was perfect! The brown rice salad recipe (found here) was delicious by itself! It would be a great item to bring to a summer BBQ and share with a bunch! The veggies were crisp and the spice just right! That is the week in review for the food coming from my kitchen! Now I'm off to go figure out what to make for the upcoming week. Hope you try one of these recipes! What did you make to eat this week? So, a friend showed me this add that she found in the paper for the 99 Cent Only Store (just realized there is no cents sign on the keyboard!) in our area. Notice how it says GOOD CHOICE and BAD CHOICE. In parenthesis next to bad choice it says "but still a great deal." 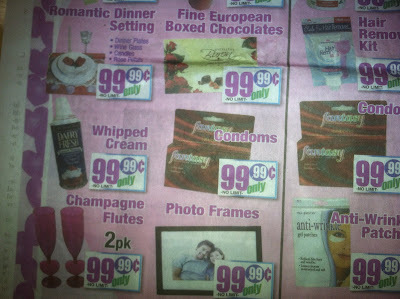 Notice the whipped cream next to the items that you would not like to buy for a dollar! 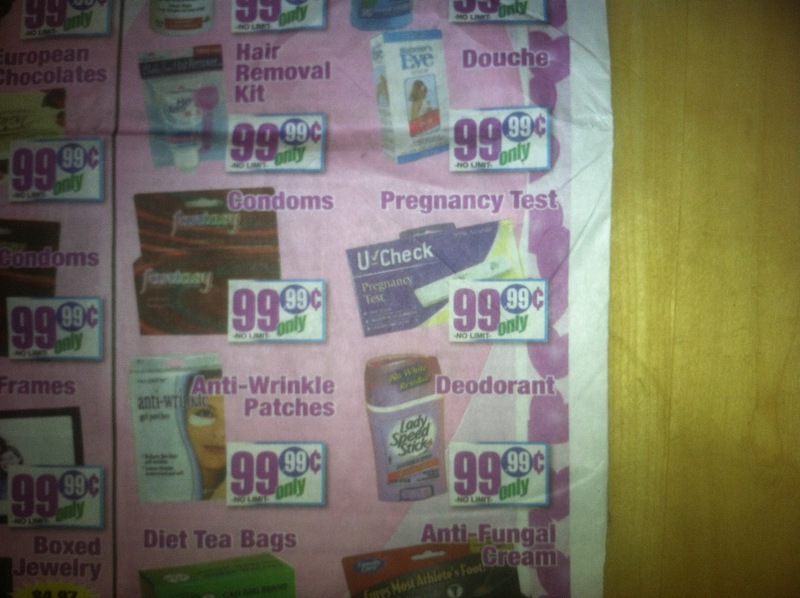 And then the suggestions for BAD CHOICES that AGAIN you would not want to purchase for a dollar!!!! 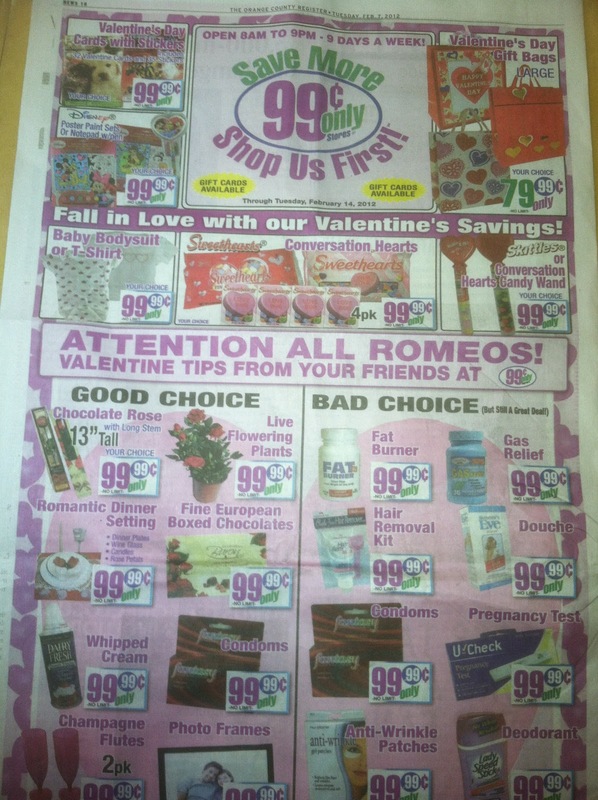 ATTENTION ALL ROMEOS - Dont shop at the 99 cent store for gifts or drug store needs. You may run into some problem that will cost you more than 99 cents!!!! 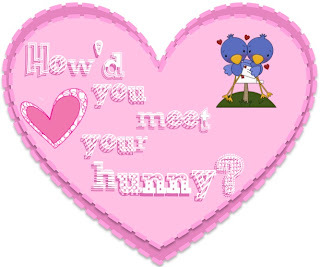 So, again Happy Valentine's Day! Hope this brought a smile to your face! What's bringing me JOY this week?!?!? 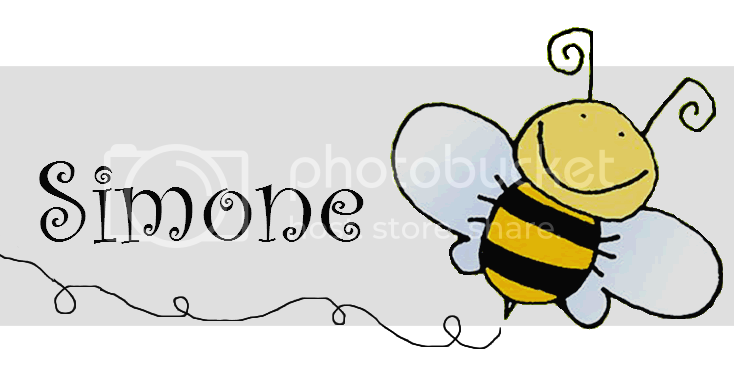 Well its this tiny little ol' BLOG! so please go check 'em out! This award is given to blogs with less than 200 followers! Thanks so much to the two ladies who kindly gave this award! I feel as though i have hit a milestone in my blogging life! So one of my responsibilities as a Liebster Blog is to award this award to 5 more blogs that have fewer than 200 followers! I had also planned to share more blogs that i have added to my following due to link ups! Hows that for killing two birds with one stone?!? 1. Emmy @ Day Dreams of a Student Teacher - Emmy has been so sweet to share some blogger advise to me and my little ol' blog! Thanks Emmy for the wonderful tip to use pixlr.com! I really enjoyed the post about the days of the week song! Check it out HERE! 2. Kristen @ One Pilgrim's Progress - I love the way this lady writes! She has quite the knack for the English language! My favorite post thus far is a post on Christianese. Hope you enjoy it! 3. Beverly @ la, la, Love, Learn, and Laugh - Loving these posts! She is cute and her posts are quite entertaining! I can't wait to try the Muscato that she recommended in her High Five for Friday Link up! 4. Abby @ Teacher "Extrodinaire" - This blog has been cracking me up! Abby has a great knack for writing this blog on teaching! I feel as though i know her already, because of her woes with testing he students! Glad its done for you Abby, but I am bracing myself until we hit our testing season! OH BOY! 5. Laura @ Tattling to the Teacher - I love the look of this blog! So cute and filled with lots of classroom ideas and also insights into the life of a teacher who is also a mom! (I am not sure how i will ever teach and be a mom! Luckily i still have lots of time to figure this out!) Anyway, head over and read her post on staying home with a sick child and then also teaching contractions in her classroom! The best part of what brought me joy this week will hopefully bring a little joy to some of my fellow bloggers! Enjoy the joy! PS. No animals were harmed in the writing of this post! Just accomplished a lot with one post! A few things I don't have to debate about are my Top 5 Pinterest Finds for Teachers this week! These are items that i hope to incorporate into my classroom and really think they are just plain great! It is also terribly awesome that we can share all these resources through sites like Pinterest, teachers pay teachers, teachers notebook, and through the multitude of blogs that we all seem to enjoy! 1. This FREE Valentine's Tot Kit seems to be something i can easily put to use for my lower functioning kiddos in my special ed classroom. You can find where i pinned this here. 2. As a part of our program at my school, we offer transportation. Our aides drive them and this provides consistency through their ride home. The van ride home can be tough for some of our little guys, so this next pin is something that can be used for any kid on a road trip or even a short trip. I plan to laminate and have on hand if a certain kiddo needs something to keep them occupied on the van! Find my pin here. 3. My next pin is from The Teacher Wife! I love this math bulletin board. I have pinned several ideas to use to make my own but i especially like the "Math Wall" Banner she made! Awesome job Lindsey! Find my pin here. 4. The next is something I cannot wait to download at school! Friendship Cards! And they are free!!! Even better! Find my pin here. 5. This last one is something i would like to alter and have a number of the week and use this as a warm up page for my little ones. 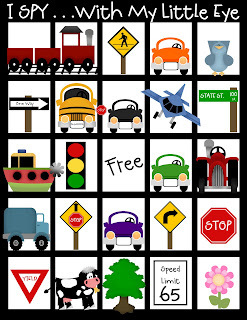 I would also make a few versions to help assist my multitude of levels in my classroom. Gonna have to revamp my warm up packets any way! See my pin here. That it for today! Hope you all are having a blessed Sunday! Enjoy the day off! PS. To those of you who have tomorrow off! Lucky you! Enjoy! I have Friday and next Monday off! Oh boy! I feel a review is in order... A review of last weeks menu items. I am contemplating this becoming a weekly part of this blog, but not sure it will be as regular. So, this week I found a fresh salad from Veggie Belly, you can find it HERE. My version of Mango Blueberry Quinoa Salad is one where i just used this salad as a topping to salad greens. Also, instead of the mango i saw at the grocery store, i used dried mango that i chopped up. I added the suggest garbanzo beans as well and made my own dressing. I whisked this all up and made more as needed because i packaged up everything for lunches this week! It was nice and light for the salad. All you need is an ounce or 2 for one serving. Overall the salad was tasty and had lots of flavor. I really enjoyed the addition of the garbanzo beans! Overall this was a great Pinterest find! Let me know if you try the dressing or even if you try the salad! It was tasty! If you like my find you can also follow me on Pinterest! Just click the link below! So much JOY to report this week! 1 The first is my husband. He has brought me much joy tonight. I came home in a rush. running about 25 minutes later than when i had wanted to be home to make sure to pick up our apartment for our weekly life group that we host/co-lead. Well, as a was walking up the stairs i was thinking of the laundry list of things i was about to spend the next hour and a half doing before i could blog! I knew the dishes needed doing, the laundry i had laid out needed putting away, our dining room table needed to be cleared and coats/jackets needed to be put away. I also needed to make sure we ate something and then i could relax a little. Well, hubby stayed home today and worked from home and surprised me with almost the entire apartment cleaned. He even changed the sheets on the bed! He had already vacuumed, done the dishes, straightened the living room, put away laundry, cleaned the bathroom and I think a few other things! This made me feel like i could actually relax and not feel completely rushed! That is a feeling i have not been familiar with all week or even for a little while (at least on a school night!) So my joy comes from the fact that he thought about me. He realized i may have needed a few minutes to relax and that brings me so much joy! Words cannot even say how much joy that brings me! Plainly put, he ROCKS! Thanks to my handsome hubby! 2. The second even that brought me joy is one of my co-workers. This week has already come with its little bit of drama and when i shared my feelings with another member of my team, she obviously knew i needed a little pick-me-up! The next day she waltzed into my classroom holding a box of Girl Scout Cookies! Its funny because right before the kids had come into the room (coming from PE) and were all talking about how my co-worker was holding Girl Scout Cookies. Despite the heads up from the kids (which in my mind i blew off as just kids talking), I was touched! This co-worker of mine is always so kind, compassionate and always ready to lend a listening ear. Words cannot express how blessed I am to have this person to work with. I know she knows how grateful I am, but it cannot be said enough. So, you know who you are, THANKS A BUNCH! BTW the cookies were the Lemonades and boy are they YUMMY! So what brought you joy today? Or even this week? Wow, its been quite the Monday! Does anyone else find that Mondays may actually be calmer than Tuesdays? 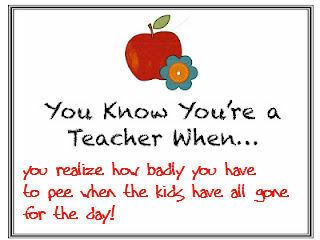 This is usually the case, but today my kiddos were not in their normal Monday form! Neither was theri teacher for that matter! I admit it, today was a day where i did not want to go. Truly i wanted to throw a tantrum instead of getting in my car... but alas, I went and it went OK. I just had a case of the Mondays! So here's something exciting... I'm linking up about LOVE! 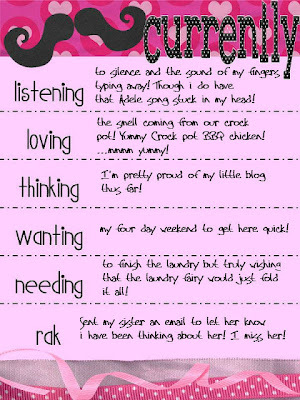 Visit Funky First Grade Fun to see what other bloggers have said they LOVE! My hubby! He's a good person to snuggle with when the scenes get too intense! By the pool or in bed! Especially on vacation by the pool! Shoes, clothes, and so much more! Lately it seems that chapstick is my collectible item! Pasta, but pasta does not love my hips! I can only eat it sporadically. Ugh! Anything really! My day, my students, crazy events, latest pinterest finds, blogging (its really new to me! ), and so many more topics! Anything! Cooking has really become a hobby of mine in the last few years. Also, I love to bake! Anywhere! The next trip is already planned, Arizona here we come! Can't wait for baseball season! Literacy, Science, and Social Studies. I really enjoy teaching reading, but absolutely love using GLAD strategies for Science and Social Studies units! Anyone else use GLAD? I do hope you enjoyed my loves! Care to share yours? Link up!